This article was originally posted (May 13, 2015) as part of A Manifesto for Digital Messiness — Rethinking the Digital by Default Agenda, which was a short series of articles supported by the Communities and Culture Network+ (CCN+). See also the final report of the project. 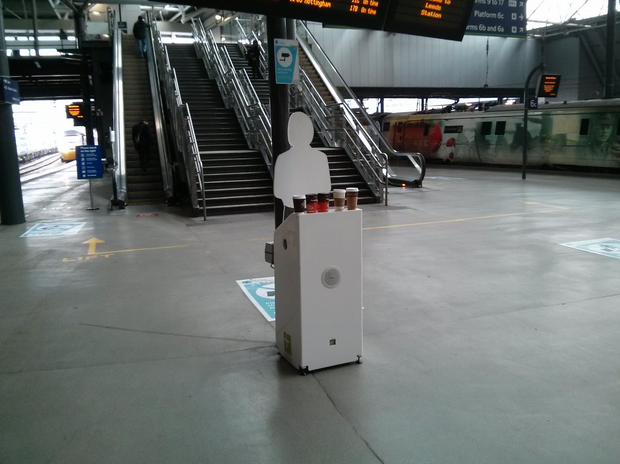 A broken stair-safety robot (projection) in Leeds Railway station collects empty cups. Companies and governments talk about making our cities smarter through digital connectivity and data processing. Our experience of smartness in a city is often in the form of street architecture or personal devices. These objects become envoys of the smart city vision, and we can start to ask questions of the smart city through them. Smart in what ways? And smart for whom? We watch a parent with two young children in a buggy try to negotiate up the main highstreet in my neighbourhood in Leeds. The road is busy at rush hour, and the pavement on the corner of the street becomes narrow, making it hard to push the buggy past. The pavement is overly narrow because a large robot is in the way and will not move. The robot is clearly being rude. This robot happens to be a surveillance camera, but I have seen similar pavement hogs working as controllers for telephone-masts or cable TV. The surveillance robot has a large metal base, very sturdy and solid – Secure By Design™. It has a long neck, like a giraffe, to reach up and look down on the bustle and life of the street. The robot can move its tiny head to view the street and the pavement below it, but is otherwise fixed in place. If we think of smart objects in our cities as robots most are still stationary ones, locked in place because they cannot be relied upon yet to move around. However these ‘very slow’ robots suggest the social norms we will expect of them in the future when they do start to move more quickly. Thinking of a smart object as a robot allows us to imagine the intentional agency it might have – the considerations of its own in addition to the rules set out by its employer. We see another stationary ‘slow robot’ in a car park. A flustered shopper approaches, several bags in each hand. As they near the car park robot, one of the bag handles snaps, scattering shopping to the floor. The shopper stops to pick up their things before continuing to the robot to pay for parking. The shopper is now one minute past the hour for their parking, and must pay for an additional two hours. If this were a human parking attendant, we would expect them to take notice of the spilt shopping, and perhaps be lenient with the interpretation of the rules. The robot refuses to acknowledge compassion or social norms (and its ruthlessness is profitable for the car park company). The ability to negotiate complex social situations, balancing and struggling with the roles and desires of those involved, is a vital part of civic living. Even the simple act of walking through a busy street is made up of many such negotiations of intention and compromise. Robots are not yet suited to moving through pedestrian areas partly because they cannot handle the subtlety of social negotiation. Robots have very high data-intelligence – recall of information and logical speed – but have little, if any, capacity for emotional-intelligence. The smart city infrastructure currently on offer is smart like a smart bomb. It can carry out a task with ruthless focus but with no ability to consider or act on human consequence (as smart bombs have shown us, high-tech smartness often does not guarantee intended outcomes). Such task-driven smartness is an uncomfortable fit with the messiness of actual civic life. Our street robots are data savants, that appear unwilling to engage with even the simplest form of understanding or compromise. It is useful to think of smart objects in terms of tact. Erving Goffman used tact to describe the social negotiations of situation, including tactics of inattention, withdrawal, and sensitivity to hints of unacceptable behaviour. Currently smart systems use vast resources of interconnectedness and processing to fake context awareness through simple pattern matching. However massive connectivity often leads to context collapse, as offhand or private information resurfaces in inappropriate situations. Perhaps what we need then is a call for Tactful Cities rather than Smart ones. A robotic data savant – bent on the rules it has been given by advertisers or traffic wardens at the cost of all else – is simply not tactful enough to negotiate the real-world situations it will find itself in.